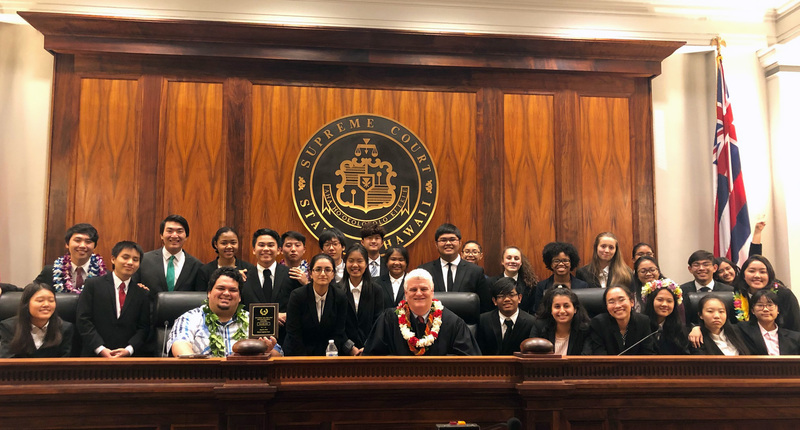 Chief Justice Mark E. Recktenwald (front center wearing lei), and teacher Tana Cambe (front left with plaque) join the Moanalua Blue and Silver teams at the Supreme Court bench after the finals. 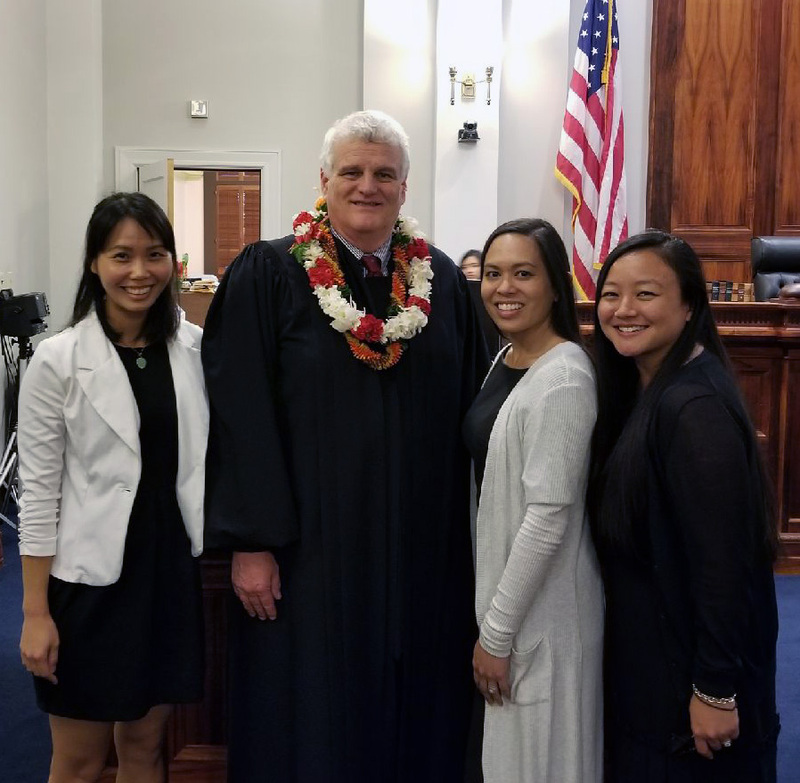 Moanalua High School’s mock trial teams swept the top two spots in the Hawaii State Bar Association Young Lawyers Division High School Mock Trial championship. Kauai’s Island School came in third, followed by the Pearl City High School White team. Thirteen teams from 11 high schools entered the competition, which began in January with preliminary rounds and culminated on March 9 in the Hawaii Supreme Court courtroom. Chief Justice Mark E. Recktenwald presided over the final mock trial. 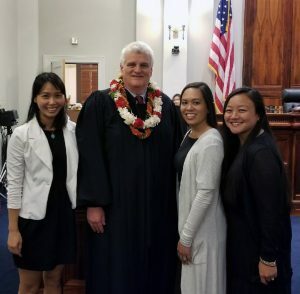 The goal of the Mock Trial Program is to “stimulate the minds of Hawaii’s high school students so that they may acquire a deeper understanding and appreciation of the American legal system,” according to the organizers. The students act as attorneys, bailiffs, clerks, and witnesses. Those playing the roles of the attorneys must prepare opening and closing statements, cross examine witnesses, and display their knowledge of the legal process and court systems. 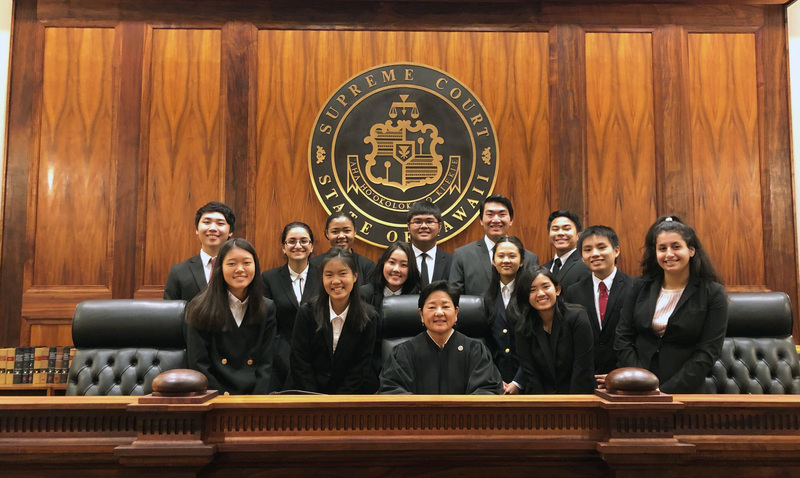 The winning Moanalua Blue team, coached by teacher Tana Cambe and volunteer attorneys Brian Kang and David Suzuki, will represent Hawaii at the National High School Mock Trial Championship in Athens, GA. in May. 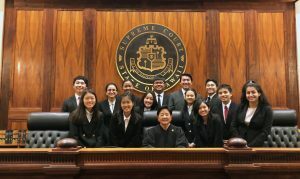 Intermediate Court of Appeals Chief Judge Lisa M. Ginoza (front center), presided over the semifinal match-up between the Pearl City High School White team (pictured here) and the Moanalua High School Blue team. HSBA Young Lawyers Division representatives thank Chief Justice Mark E. Recktenwald for presiding over the final mock trial. From left, Elaine Chow, Chief Justice Recktenwald, Summer H. Kaiawe, and Kyleigh Nakasone.